Why do you need an Ether Wallet? Many companies raising on Republic Crypto use securities instruments that can be repaid in tokens at a future date. The most common uses of tokens are to represent shares in a company or to be used as a way to pay for the use of the product a company is offering. Tokens are held through a wallet. A wallet holds and secures the tokens you own. Your wallet consists of a public address which is used to identify your wallet and the tokens it holds. In fact, within the software of the token, there is a piece of data which keeps the address of the wallet which owns it. When investing on Republic Crypto, we generally ask for a wallet address as part of the investment process. This address will be used by the issuing company to send you tokens if they are due to you. Before we give you instructions, we should make a few simple disclaimers, setting up your wallet is your personal responsibility - while Republic is providing this guide as an educational tool, we can't be responsible for for your wallet's set-up or security. You should do you own research and diligence before creating a wallet and when making decisions on how best to secure it. If you already have a wallet and just want to get the public address, click here. 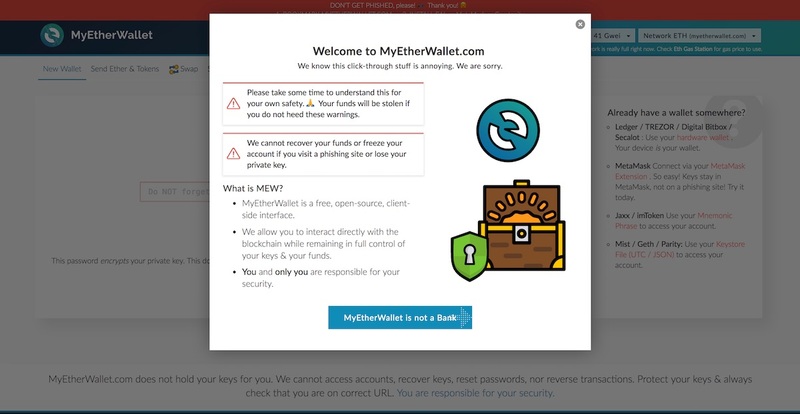 In the following set of (rather lengthy) instructions, we'll instruct you on how to create and Ethereum wallet using a website called MyEtherWallet and also how to find out the wallet's public address. We highly suggest you go through the information provided in this mini-tutorial. This website will make an ether wallet for you and give you the necessary details to access and use it, however it won't keep your wallet secure for you. That's your responsibility and this tutorial gives important information on how to do so. To go through the tutorial, you press the blue button with the arrow on each page. 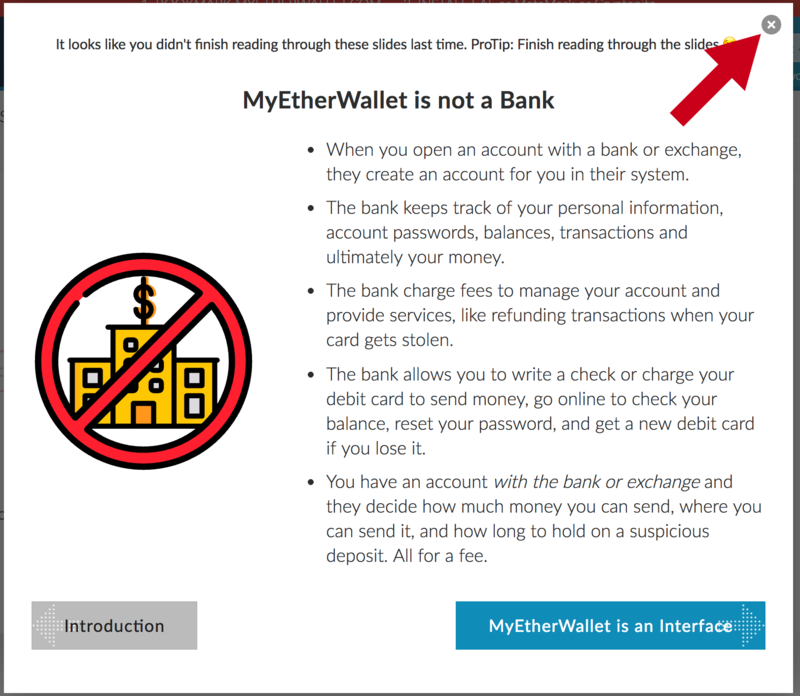 If you're already aware of what needs to be done in order to keep an ether wallet safe, they do give you the option to quit the tutorial by clicking on the tiny cross on the top right (we've pointed at it in the screenshot below. 3. You should now see the MyEtherWallet homepage. The homepage happens to be the fastest way to create a new ether wallet. You start by entering a password in the box (we've pointed at it in the screenshot below). As with all passwords, make sure it's strong (Here's a good article on how to do that). Once that's done, click on the "Create New Wallet" button. 4. The next screen you're taken to will ask you to save you 'Keystore' file. Your keystore file is similar to a backup key to your house's front door. If you lose your main key, you can use it to access your house. However, if someone else has your backup key, they too can get into your house. Your keystore file is evidently not a physical object but a computer file. You should download your keystore file and keep it in a safe location in your computer or on the cloud that only you have access to. Ideally you will make backups of this file and keep them in equally secure locations. To get through this step you click the "Download Keystore File (UTC/JSON)" button. Your browser will give you an option of where to save this file. If this is the case, choose a SECURE location. Your browser will automatically save your file to the default download folder. We suggest that you immediately find this file, and move it to a more appropriate and secure folder. Once you've downloaded the file, the "I understand. Continue." button should go from a blush red to a more solid red. And you'll now be able to click it. Go ahead and do that. 5. The next step involves your private key. If we continue the analogy with your house door, your private key is your main key. But unlike a physical key, it's significantly easier to duplicate. If someone knows your private key, they have as much access to the wallet as you do. Unlike a password, or a house key, you cannot change your private key. What this means is that you should never let anyone see your private key, unless you're willing to give control of everything that is in your wallet to them at any point in time. We recommend that you keep a copy of your private key in an extremely secure location. A popular solution is to write down your private key on a piece of paper and store it in a safe only you have the combination to. But make multiple copies and be sure that you copied it accurately. You'll notice that your Address is also on the image. A public address is what is used to transfer tokens to your wallet. It is okay if other people know your address, it gives them no control over the contents. The public address is what you will have to provide to Republic so that the company you invested in can transfer tokens to your wallet. After you've gone through the necessary steps to safeguard your private key, go ahead and click the "Save Your Address" button. 6. You should now be taken to a screen that asks you to "Unlock your wallet to see your address"
For the sake of this tutorial we'll unlock your wallet using your private key. 7. If successful, a blue bar will temporarily appear at the bottom of your screen saying "Wallet successfully decrypted. If you scroll down now, you should be able to see all your wallet information. Including your address, your private key (which can be made visible by pressing the little eye icon), as well as your token balances. We've highlighted your Account Address with a red box since this is what you will need to enter when you submit your wallet address to Republic. 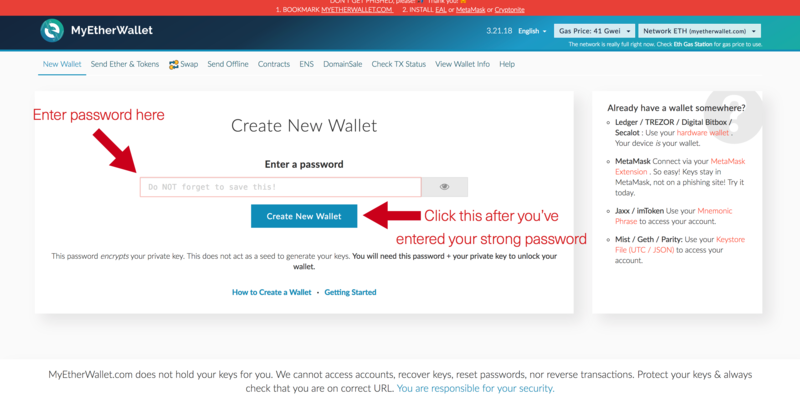 How to access your wallet on MyEtherWallet if you already have one. If you already have an ether wallet and you just want to get to the "Wallet Information" screen in step 7 it should be quite straight forward. 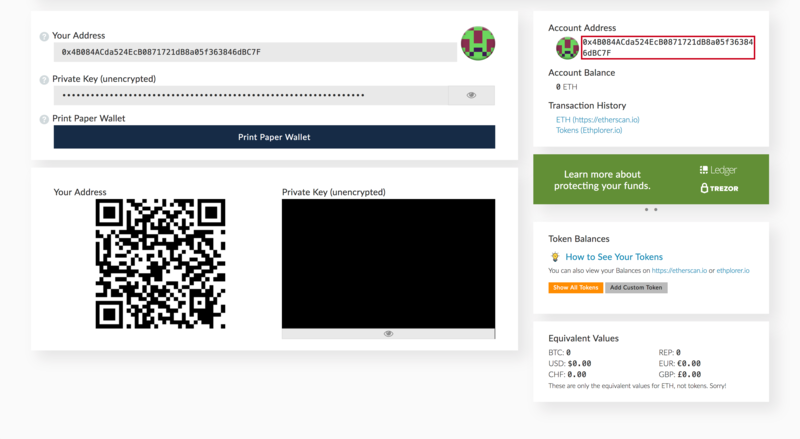 When you see the homepage upon going to https://www.myetherwallet.com, click on the View Wallet Info button near the header (circled below). Look familiar? 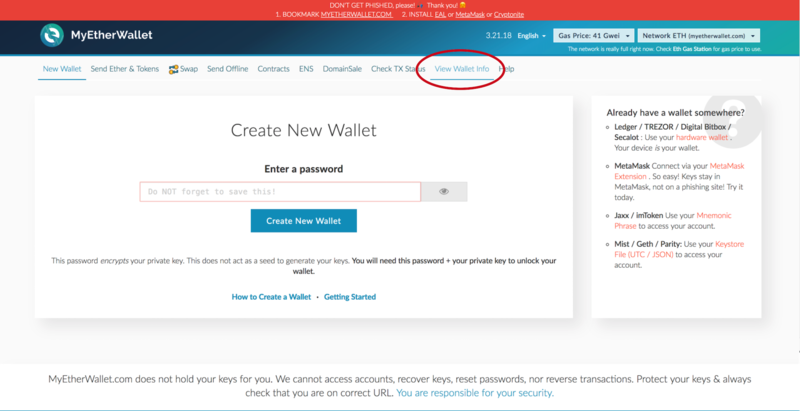 You can now follow the same instructions as Step 6 in this tutorial to access your wallet information. Good luck and let us know if we missed anything - you can always e-mail us at [email protected] to suggest improvements to this guide.